Next season the UAE Rugby Premiership will be boosted by the inclusion of the Dubai Tigers. This comes off the back of two consecutive Conference championship winning seasons for the ‘red and whites’ as they earn their place in the top tier of Gulf rugby. In its short time of existence (founded in 2013), the Dubai Tigers Rugby Club has gone from strength to strength, starting with a small Junior rugby section of 40 players to today where it boasts over 300 playing members across its Junior, Women’s and Men’s senior squads. 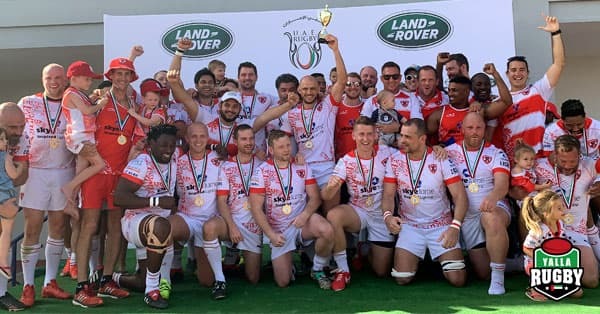 The Tigers once again confirmed their status as champions two weeks ago when they beat a spirited Al Ain Amblers side to lift the UAE Conference trophy after a dominant unbeaten 2018/19 rugby season. 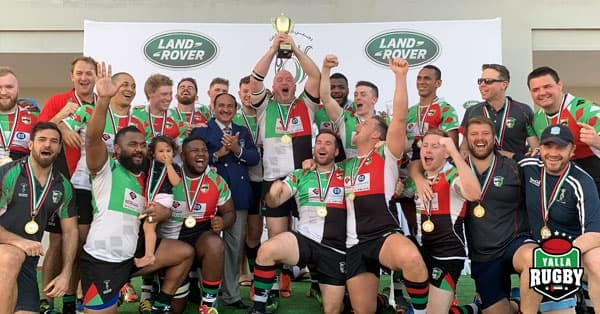 The Dubai Tigers will join current Premiership teams – Dragons, Eagles, Exiles, Harlequins and Hurricanes and will also see their 2nd XV team rise from the UAE Community league to the UAE Conference League. 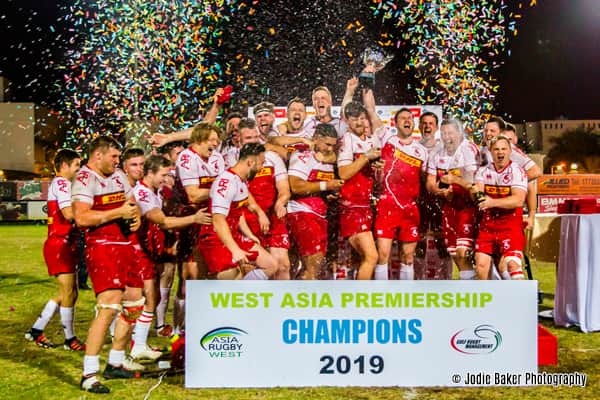 It is often said that Rugby is a game of fine margins, and no one will better attest to that than those who witnessed the heart-stopping finale of this year’s West Asia Premiership in Bahrain. The home side ran out 23-21 winners, yet for a fleeting moment, it was the Dubai Exiles celebrating victory as Durand Gerber’s last gasp 50m penalty sailed straight and true towards the uprights. 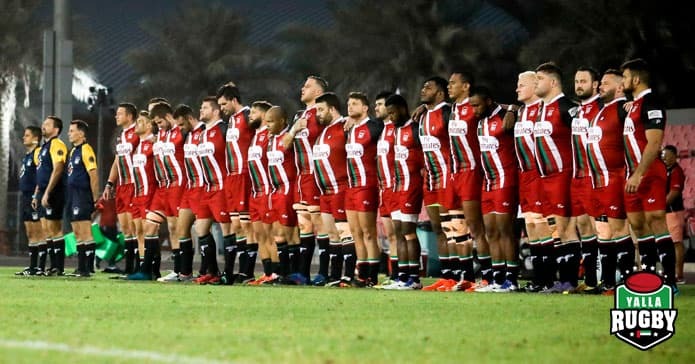 A cluster of red shirts under the posts frantically indicated that the kick had fallen just short, and time stood still until, after consultation with his assistants, the UAERF Referee – Tony Duminy confirmed their verdict. Cue pandemonium in the stands and enormous relief for a Bahrain side who had looked to be cruising towards the title just moments earlier. Leon Mauer’s penalty with just ten minutes on the clock had restored a 10 point cushion for the home team who had led 17-6 at half time and came into this fixture undefeated since falling to Exiles at The Sevens in October. Exiles though, having hung in there for large periods of the encounter played out in-front of a partisan Bahrain crowd began to take control of the tight exchanges as Bahrain seemingly caught the jitters. First a scrum penalty with just 4 mins on the clock was converted by Gerber to reduce the arrears to one converted score. Then after a series of further infringements at the breakdown helped the visitors gain field position, they worked an opening on the right flank for winger Stubbs to score with what would have been the last play of the game. With tensions boiling over ahead of the prospect of extra time, Bahrain were adjudged to be the guilty party in instigating an off the ball altercation meaning that Exiles would restart with a penalty on half way and a chance to win the game outright with the final kick, even after the touchline conversion drifted wide. The thrilling climax had looked unlikely for much of the game, Bahrain having taken an early lead through a converted score by centre Jack Phillips. A second Phillips score from a perfectly executed set piece move and the boot of Ross Preedy had at one stage built up a 20-6 advantage before a much improved second half showing from Exiles nearly culminated in the most dramatic of smash and grab raids. As impressive as Exiles’ comeback was on the day, few can begrudge Bahrain their slice of luck in holding on at the death. They have been the outstanding team in this year’s West Asia Premiership competition by some way and hosted a fitting showpiece occasion for the final – which can be relived in full courtesy of Bahrain’s facebook live video. 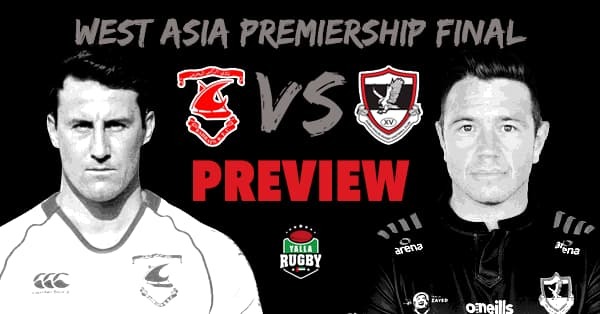 After 47 fixtures and over 2,500 points scored, this season’s West Asia Premiership reaches its climax on Friday with a grand final to decide the 2019 Champions. Here’s what you need to know. The final will be hosted by Bahrain at their home ground in Saar. Having gone into the end of season playoffs as number one seeds, they earn the right to stage the final at home in front of the so-called ‘red wall’ of support. The event promises a carnival atmosphere with live music and kids entertainment, entry is free for club members and BAR2 for guests. Kick-off is scheduled for 17:00 but if you can’t make it to the game in person, Bahrain are planning to run a live stream via the club’s facebook page. Finishing first and third respectively after 15 rounds of regular season games, saw both sides through to last weekend’s semi-finals. Top seeds Bahrain benefitted from home advantage, cruising to a 56-7 win over reigning champions Jebel Ali Dragons. 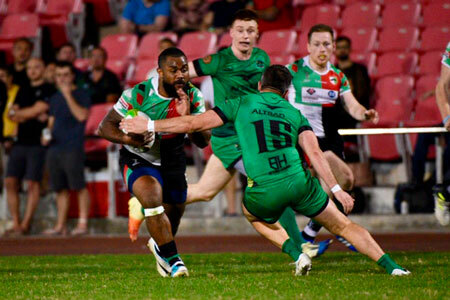 Exiles faced a tougher assignment, away to Abu Dhabi Harlequins side who had finished 13pts above them in the final league standings, coming away with an upset 31-16 win. What does the formbook say? It would be difficult to argue against Bahrain going into the final as favourites. Any away fixture in Saar is a tough assignment for sides having to take the morning flight across the Arabian Gulf – let alone in a season where Bahrain have been beaten only once in the XVs format. Intriguingly however, the only side to have got the better of them this season, is in fact the Exiles, in a 31-20 win back in October at The Sevens. The recent return fixture saw a Bahrain win by an identical margin of 11pts. So in head to head fixtures there is nothing to choose between the two and Exiles will fancy themselves as the side to halt the Bahrain juggernaut at the final hurdle. A look back at the final round of regular season action in the top two leagues, and our first taste of knockout rugby in both the Premiership and Community leagues. 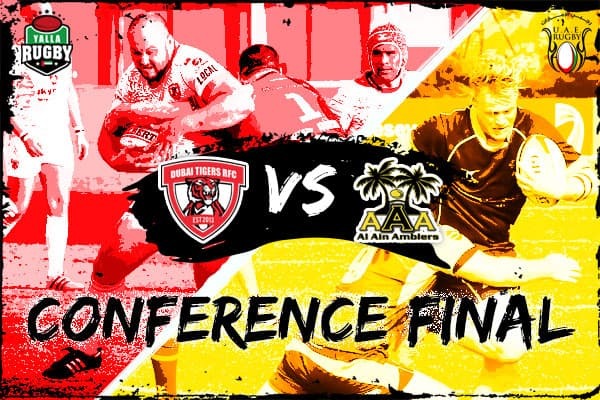 One of this most intriguing storylines to evolve from this season has been the rivalry between Al Ain Amblers and Abu Dhabi Saracens as both looked to secure the second Pool B semi-final slot, behind the dominant Dubai Tigers. An impressive 34-22 away win at Hurricanes 2s sealed qualification for the Amblers and indeed second place in the combined league table having lost only three matches this year (two coming against Tigers). They must now repeat the trick in the semi finals as, despite a larger points haul, Canes will enjoy home advantage due to the fact they were top of Pool A.
Bahrain and Dubai Exiles will contest the final next week in Bahrain after both winning their semi finals this weekend. 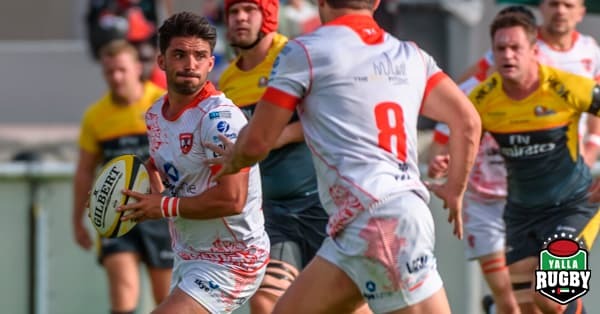 Bahrain will go in as favourites, having topped the league rankings they underlined their pedigree in crushing Jebel Ali Dragons 56-7. Exiles upset Abu Dhabi Harlequins 31-16 at Zayed Sports City to earn their place in the showpiece. 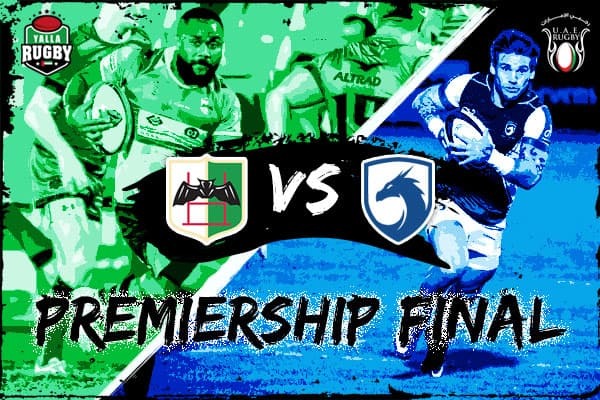 The season will then culminate with the UAE Premiership semi finals offering Quins, Exiles, Dragons and Hurricanes (who missed out on the West Asia knockouts) another chance for silverware at finals day. The aforementioned Amblers were the big winners of the weekend in claiming the only playoff spot left up for grabs. Abu Dhabi Saracens benefitted from a forfeit by Exiles 2s to also gain a 5pt win, but Amblers superior point difference takes them through by the finest of margins. In the only dead-rubber match to go ahead, Dragons 2s eased past Sharks 41-12. The semi final fixtures took place last weekend and as widely expected it will be Barrelhouse and Dragons 3s who meet to contest the honours on finals day. There was nearly a shock in the first semi final however, with Barrelhouse surprisingly pushed all the way by a Harlequins 3s side, perhaps benefitting from absence of a 2s fixture. In the end, Barrelhouse edged out a 19-15 win and will look to complete an unbeaten season by winning the final. Dragons’ qualification was somewhat more straightforward, overcoming a spirited RAK Rugby side 31-5. 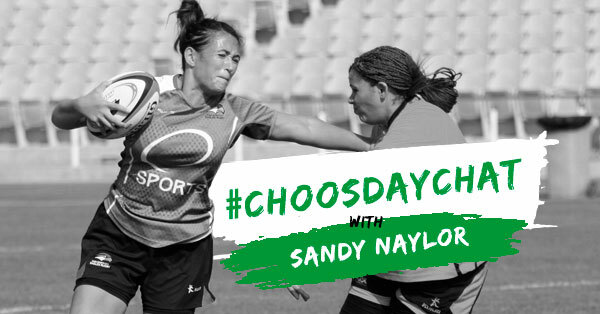 We have a Choosday Chat with RAK Rugby‘s Fly Half, Kyle Bennie. Two people really spring to mind; Firstly my big brother Mitchell, he got into rugby and was obsessed. We used to throw the ball about for hours trying to perfect passing off both hands and then move onto kicking with both feet, we also used to watch as many rugby games as possible! We even used to rent old international games which were recorded on VHS. Secondly, my old school teacher Mr Jon Kendry, a proper Welshman, he would push me to my limits in the majority of sports but helped me focus on my rugby and was one of the main reasons I stuck at it and didn’t go down the football route. Thank God! Whats been your proudest moment playing rugby in the Middle East? When I was younger and playing with the wrong shaped ball, I was nicknamed “Wee Barra” after a famous Rangers player but when I turned to the proper egg shaped ball I didn’t really have one. 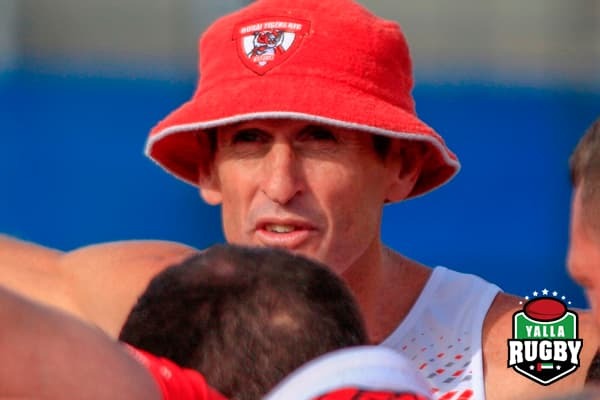 Everyone just referred to me as “Bennie” or “KB” until I joined the Lakes Legends many moons ago, unfortunately with bad hair doos and a few questionable dressed to impress moments at 7am for training – they refer to me as “Corey Jane” or “Corey”. I have four kids and a corporate job so I don’t have much spare time but when I do…. I like to spend it with the family out exploring and camping or playing golf or going out motorbiking in the dunes. Ironically I asked the Mrs recently if she knew any of my hidden talents and she said YES! “Looking busy and achieving Sweet FA around the house!” Apart from that, some say I am pretty good on the triangle and not to shabby around the kitchen. Easy – Eat and Drink, Charcoal Chicken, full service with mutton soup and extra fries. I’m not even ashamed. Definitely flying. It would be easy to travel about and I’d never sit in another traffic jam again!! I miss the usual – the family, the fresh air of the countryside and the different seasons (usually within the same day in Scotland!) and reality! Sometimes being here, you get engulfed with living the expat lifestyle. Who are the jokers at RAK Rugby? 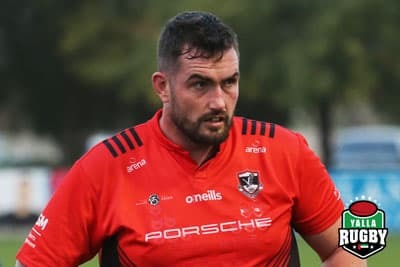 Of late it would have to be Brian O’Discin (Disco) for his constant messing about and pulling some funny snide remarks out the bag and Dale Rooney, simply because he is a Northern lad and rugby league convert, bringing a completely different yet hilarious chat to the group. 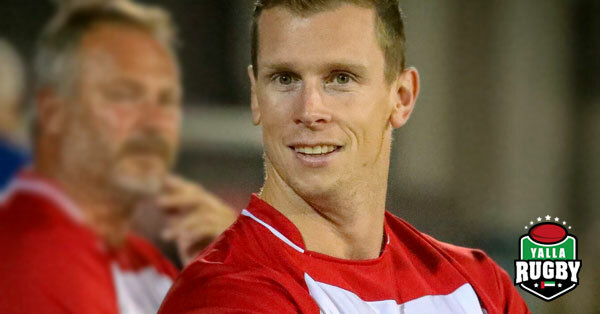 It would be a mix between Tomas Young (Mossy) as on his day, he is a tackling machine and seems to be everywhere around the park or Kieran Dorgan as he is lighting and has a great kicking game from his Gaelic football background. Elvis Presley, I’m pretty sure he would have a few good stories to tell. Sir Richard Branson, business knowledge and his approach/views on life and one of my late grandparents, purely from a personal perspective on who, what, where, when, why and the old family stories. Who has the worst Dress sense in the squad? They are all contenders in their own right, but it would have to be Oisin MacPartlin for his horrendously bright training gear or Neil Jose Carleton with his “don’t give a s&%t attitude (Yes mate – green trainers, yellow socks, blue shorts and a red t-shirts does work! Looks spiffing). What are the best things about being part of RAK Rugby? How’s life in Ras Al Khaimah? RAK is good. I have only been here 2 years but it reminds me of the “Good old Dubai days”. The community isn’t too big, so you can always see a familiar face or two around town. There is also lots on offer, more adventurous and outgoing opportunities as the mountains are in the back drop and there is a slight temperature difference. We began the season back in Week one by picking out Barrelhouse as a team to watch this season after seeing them rack up 50 points on an impressive league debut. So it has proved as the season has progressed with the newcomers defeating Dragons 3s 32-31 in a thriller to finish top of the regular season standings in the Community league. They now go into the playoffs as top seeds and will be heavily favoured to get past Harlequins 3s for a place at Finals Day. An impressive effort for the club in their first season of competitive XVs. Little change in the standings this week as Hurricanes came close to recording a win away at Harlequins that would have lifted them back into the playoff places but fell agonisingly short in a 35-34 reverse at Zayed Sports City. Exiles recorded a comfortable victory over the Eagles, which guarantees their playoff spot. Three fixtures took place this weekend, with all being won by sides from Group B. Abu Dhabi Saracens and Al Ain Amblers continue to match each other in the quest for the final playoff spot both recording comfortable home bonus point wins over Hurricanes 2s and Eagles 2s respectively. Level on 46 points, it is Amblers superior points difference that gives them the edge at the moment, a bonus point win next week over Canes 2s should see them through but Sarries are poised to pounce on any slip up. Elsewhere Dubai Tigers 1s kept up their unbeaten run, grinding out a 31-17 victory away at Quins 2s. This round of fixtures saw the final league standings and playoff fixtures decided. Barrelhouse edged Dragons 3s in the clash of the two unbeaten sides for top spot. A high scoring win for Tigers 2s away at Al Ain briefly put them in contention to gate-crash the top four, but both RAK Rugby and Harlequins 3s were able to get the job done in their respective fixtures to earn themselves a top four finish. RAK were pushed all the way by the Shaheen who will be pleased to have put 38 points on the board in their final fixture despite falling to defeat. 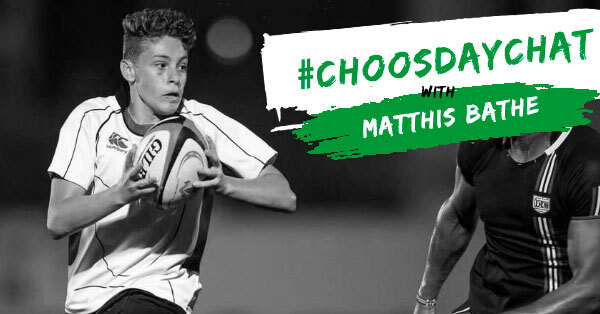 This week’s UAE Rugby action from across all three leagues. It has been well documented that 2018 was a difficult year for a side which were West Asia Champions as recently as 2015. Results on the field saw demotion to the UAE Conference at the end of last season but struggles off it have really tested the resilience of the club. The early signs are that 2019 might see Sarries turn a corner in their rebuilding phase. They have gone three wins from three in January, conceding only 12 points in the process and two of those matches coming away from home. Locked in a battle with Al Ain Amblers to secure a playoff spot, they are building momentum at the right time of the season and bringing much needed confidence back to Al Ghazal. Dubai Exiles were the big winners in this round of matches, claiming a hard fought local derby win at The Sevens over Dubai Hurricanes 32-27. That lifts them to third in the standings as they jostle for playoff spots along with Canes and Jebel Ali Dragons. Dragons themselves were edged out at home by Abu Dhabi Harlequins 29-25, a win which sees Quins all but guaranteed second spot with Bahrain clear at the top. The game of the week in the Conference also came at The Sevens and it was another agonising defeat for the home club with Canes 2s edged out 46-44 in the last minute of a tumultuous free scoring contest with unbeaten Dubai Tigers 1s. The three top 1s sides all recorded wins over their Premiership second team opponents with Al Ain Amblers cantering past Quins 2s and Abu Dhabi Saracens travelling down to Jebel Ali and recording an impressive 27-5 away win. Conversely, amongst the sides towards the bottom of their respective groups, it was the second strings who claimed the points with DSC Eagles 2s and Dubai Exiles 2s claiming only their second and third wins of the campaign respectively. Nearing the end of the regular season in the Community League and just two fixtures were completed this weekend. Dragons 3s maintained their unbeaten record in sweeping past Tigers 2s to keep up in the two horse race at the top with Barrelhouse. The mid-table clash between Amblers 2s and RAK Rugby went the way of the northern emirate side 36-19, a result which sees them climb back to what is almost now their customary third place in the standings. More action this week from the West Asia Premiership and UAE Conference rugby league. Al Ain coming away from Jebel Ali with a comprehensive 45-21 win, over a side that had previously lost on just one occasion this season might be seen as the upset of the round. Though that would overlook the fact that the Amblers were only a whisker away from toppling league leaders Tigers last week and seem to have run into a rich vein of form at just the right time of the season. If they can hold off Abu Dhabi Saracens for a playoff spot, they will be a threat in the knockout stages. On paper this week’s main event was the top of the table clash between Abu Dhabi Harlequins and Bahrain, but with the away side winning in irresistible fashion, narrowly missing out of putting 50pts on Quins, the drama ended up being found elsewhere. DSC Eagles suffered a heart-breaking loss to Dubai Hurricanes, a match that is becoming a real rivalry in Dubai. Canes clinched it 27-25 with a last second try in spite of a large period of stout Eagles goal line resistance, leaving the hosts rooted to the foot of the table and still without a win. It was just as close fought in the other Dubai derby between Jebel Ali Dragons and Dubai Exiles, the Exiles claiming a four point win which moves them up to third in the West Asia standings. All change in the fixture lists at Conference level as sides in the 1s group and 2s group played against one another for the first time. The top 1s sides recorded some impressive results with Abu Dhabi Saracens keeping pace with the aforementioned Amblers thanks to an away win 49-7 over DSC Eagles 2s. Hurricanes 2s were the other big winners of the round, with their comfortable away win at Arabian Knights coupled with Dragons 2s loss seeing the Canes take over as the top ranked 2s side and gain pole position for a favourable playoff draw. The Sharks and Exiles forfeited their games, giving both Tigers 1s and Quins 2s easy bonus point wins. 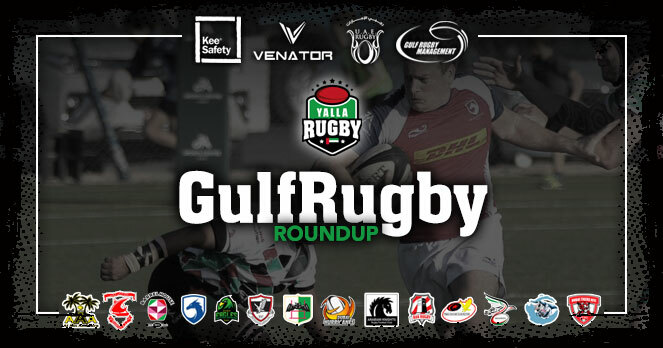 News from the first round of Gulf Rugby action in 2019 with fixtures taking place across all three men’s divisions last weekend. A week where fixtures largely went according to the formbook contained no stand out results with high scoring home wins largely the order of the day. West Asia Premiership leaders Bahrain are the major exception, travelling to The Sevens to face a resurgent Hurricanes still buoyant from their Dubai 7s triumph last month, they dismantled the home side to win 44-19 claiming a bonus point and maintaining their cushion over Abu Dhabi Harlequins ahead of next week’s top of the table clash in the capital. Bahrain and Abu Dhabi Harlequins both kept up the pace at the top of the table with high scoring bonus point wins. With Bahrain dispatching a Hurricanes side who came in to the week in third place, the gap between the top two and the rest has in fact widened further. A win for Jebel Ali Dragons in a high scoring 54-31 encounter with Dubai Eagles moves them up in to third, leapfrogging both Canes and Dubai Exiles. We can expect to see plenty of jostling for position between these three in the season’s closing weeks. The West Asia playoff race is now looking clear as Dragons, Exiles and Canes all fight amongst themselves for 3rd and 4th places in the table to secure playoff action, all signs point towards January 18th’s crunch fixture at Zayed Sports City between Harlequins and Bahrain acting as this year’s title decider. The last round of initial group fixtures before crossover matches between 1s and 2s sides contained no surprises. Harlequins and Dragons 2s racked up comfortable home wins over Exiles and Eagles 2s respectively. It was ‘must win’ territory for Quins as they eased past Exiles 32-8, still sit 10pts behind Hurricanes 2s, who had a bye week, and mathematically at least still in the race for a playoff place as a result. Amongst the 1s group, Abu Dhabi Saracens put together a convincing win over Arabian Knights, who, despite being yet to register a win this season, deserve credit for continuing to compete week in week out. The real drama came over at Al Ain Amblers where Dubai Tigers having gone all of 2018 unbeaten, nearly came unstuck at this year’s first hurdle but held on to edge past the home side 22-19. Wins for Barrelhouse and Dragons 3s maintained both sides’ 100% records and further increased the likelihood that they will meet on finals day to decide the title. In falling to league leaders Barrelhouse 43-7, RAK Rugby slip behind Tigers 2s in the chasing pack. After a difficult start to the season, Tigers have registered three wins on the bounce, edging out local rivals Dubai Sharks 2s 26-25, and could yet sneak into contention if they can win away at the Dragons at the end of the month. There were over 100 points scored in the weekend’s other fixture in Al Ain where the Amblers 2s defeated Shaheen 67-36. Consolation for the Shaheen comes in the form of a 4 try bonus point and their first league points of the 2018/19 campaign. If you’re looking to see who’s got the latest ‘bragging rights’ in our Top Scorers table, then head straight over to our Top 10 Stats page.